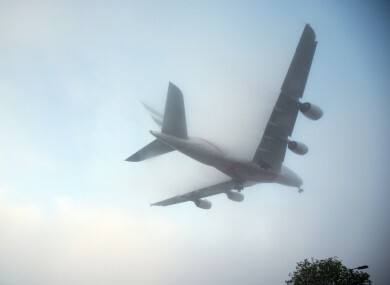 A NUMBER OF flights to the UK have been cancelled this morning due to heavy fog affecting visibility. The travel disruption began yesterday with Met Éireann issuing a fog warning for a number of areas across the country and airports here and in the UK advising passengers their flights may be affected. This morning, six UK flights have already been cancelled according to head of external relations at the airport, Siobhán O’Donnell, who spoke to RTÉ’s Morning Ireland. She said low visibility procedures are also in place in Dublin Airport due to fog, which may cause some delays for other flights. All Irish airports are advising passengers to check with their airlines to ensure their flight is still due to depart. In Shannon one London flight has already left, but passengers on later flights are being told to get in touch with their airlines. Good morning from Gatwick. Foggy conditions expected today. Please check with your airline directly to see if your flight is affected. The fog is expected to lift later this morning, but knock-on delays are likely. For those of you on the way to work this morning, there is also reduced visibility on the roads. Fog is widespread throughout the country this morning, be careful and leave a little earlier. Motorists are being advised to use their fog lights and allow extra time for their journeys. Email “Flights to UK cancelled as heavy fog lingers on runways”. Feedback on “Flights to UK cancelled as heavy fog lingers on runways”.